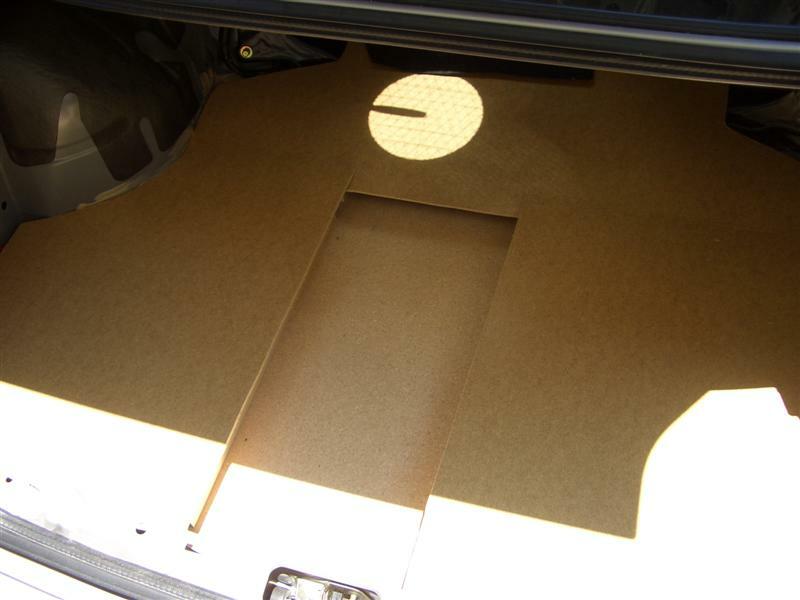 Background: I have very little experience in car audio & wood working, etc, but I think this has come out very impressive. 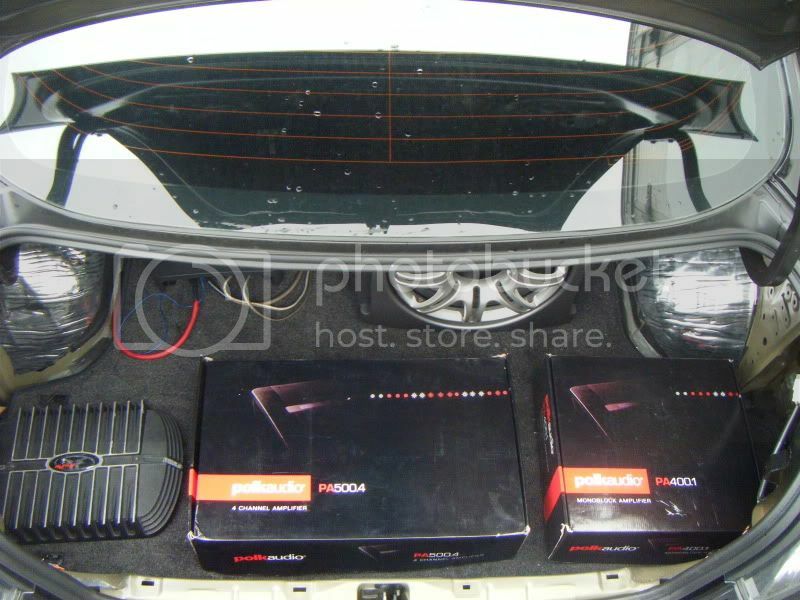 I used to have an mtx 5400x amplifier running my entire car, but now I decided to go with an eclipse since my mtx broke. 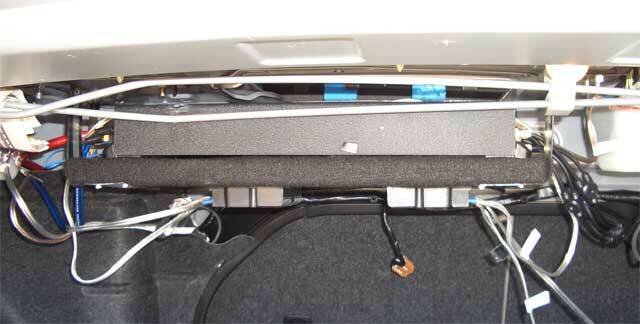 Here is a picture of how I used to have my mtx mounted at the top of my trunk. This was a fairly nice setup as the amp was out of the way, but for the life of me, I could not get those wires to hide themselves. When the mtx went out, the eclipse was too big to go there. Had to go do the drawing board. With a plan in my head, I started. 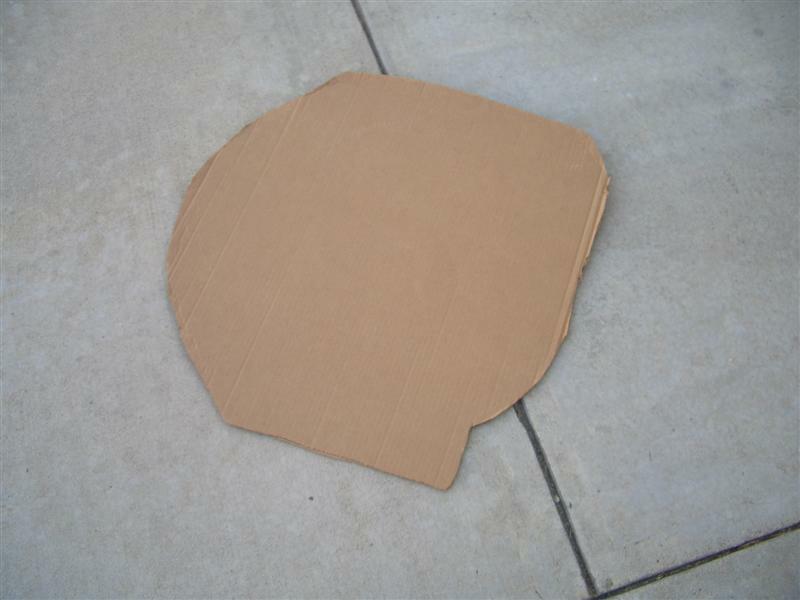 I made a cardboard template of my spare tire well. After a decent fit, I transfered that cut to wood. I made the cut on the wood slightly larger than the cardboard so that I could cut notches in the wood to contour the unevenness of the sides of the well. Next, I measured and put railings on the side to protect the amp. Drilled holes for the plexiglass. Made one hole on each side for wire to go through. I started measuring distances to keep the edges of the woodboard even. Finally, I screwed in some pieces of wood so that the board could rest against the amp/base and not slide around. I started this monday night, finished it wednesday afternoon. I still have to carpet all of those panels. Right now I just put the factory carpet on top of everything and covered it up. It looks very nice and clean now, so I am VERY tempted to leave it as is. Please note, I did fabricate a lock down to prevent theft. It is not pictured for obvious reasons. Cool! How much for a new piece of plexi? I'd maybe add a cold cathode light and show that puppy off. Very nice looking install, man. Has a very seamless and integrated kind of look. Congrats! The only thing I'd be worried about is that it doesn't appear to be getting a lot of ventilation. However, you've probably already checked that out. I paid $30 for that sheet, but I had cut it nearly in half. The left over piece is slightly smaller than the other piece, but might work. I have a few other things I need to finish on my car before I get back to this. I am going to put a new plexiglass there, but this time, I will spend more time on it and put Eclipse, Polk & Image Dynamics etches in it. I was thinking of installing a cathode in there, but I'm feeling lazy now. I have a power distro box near the amp, so we're good to go with power. I thought about ventilation, but when I had it on the temporary setup with the carpet on top, it had no problems. If I run into problems, I'll make some holes in the plexiglass. looks good!! how do you like the sound over the mtx? Nice job. 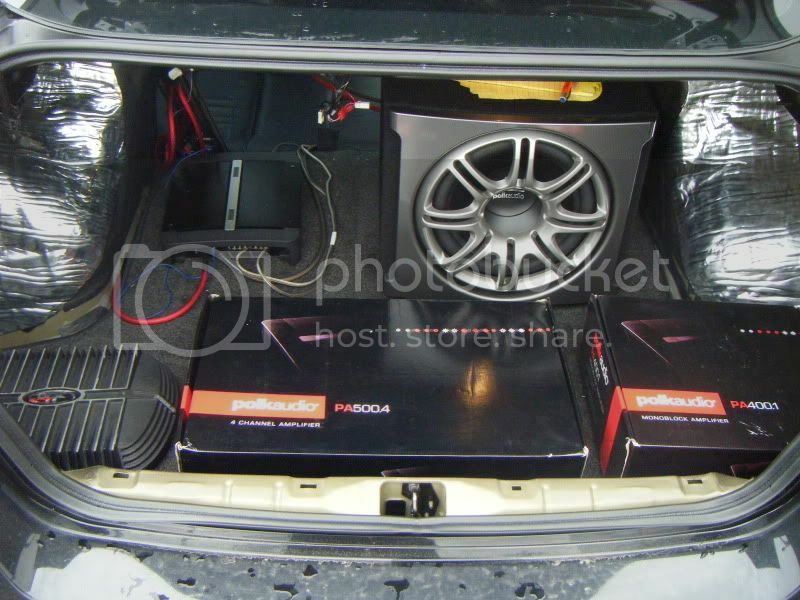 I have been thinking about redoing my trunk. Nice job, How strong is the false trunk? Can you still fill up the trunk if needed? 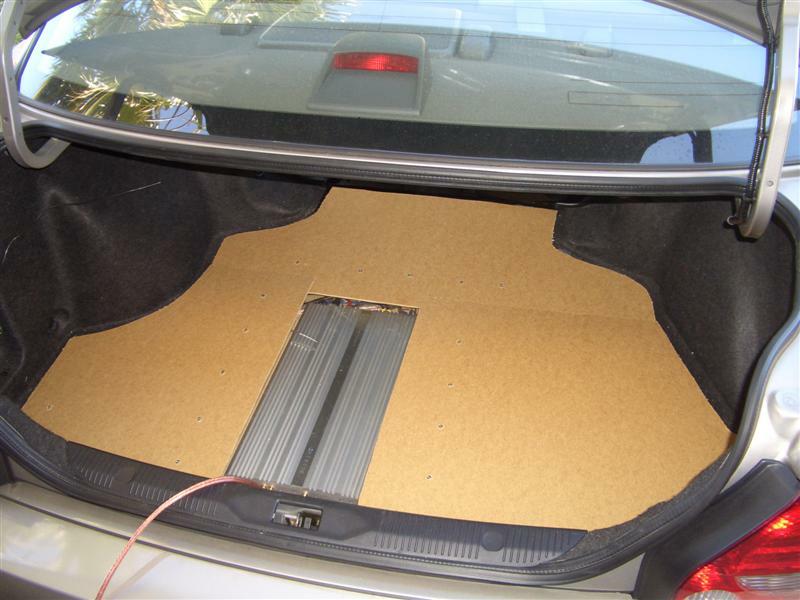 I assume that's why you made the false bottom to still be able to use the trunk. yup, I've put suitcases, etc on top of it. So far so good. I would stand on it to see how tough it is if the plexiglass wasn't cracked. Thanks guy, I think I'm gonna try something like that in my Scion Xb in the spring. Since PA500.4 is freaking huge looks like false floor is my best option. This thread just gave a few ideas to chew on. Any advise/ideas/hints u guys can give me?? I'd say test fit everything. You've got a lot you're installing and you'll need to make sure everything fits before building. 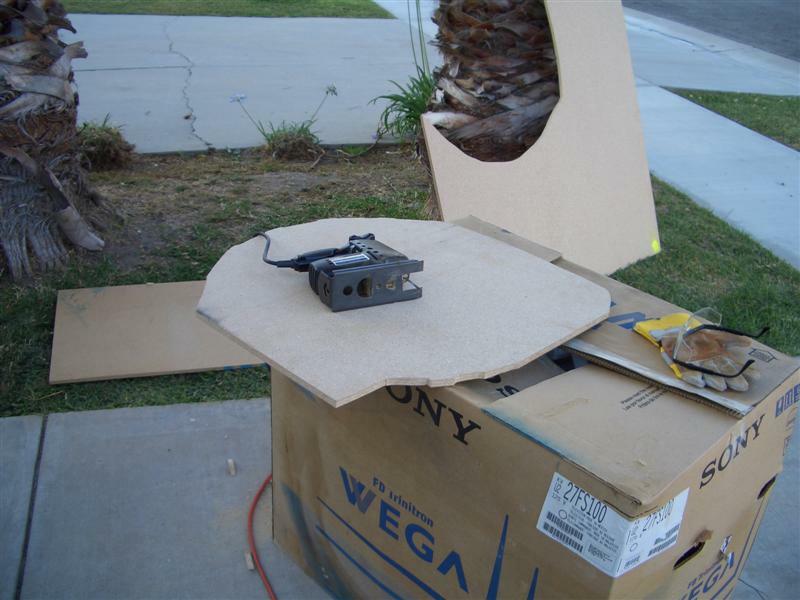 I made my templates out of cardboard which made it easier to cut the wood later on. 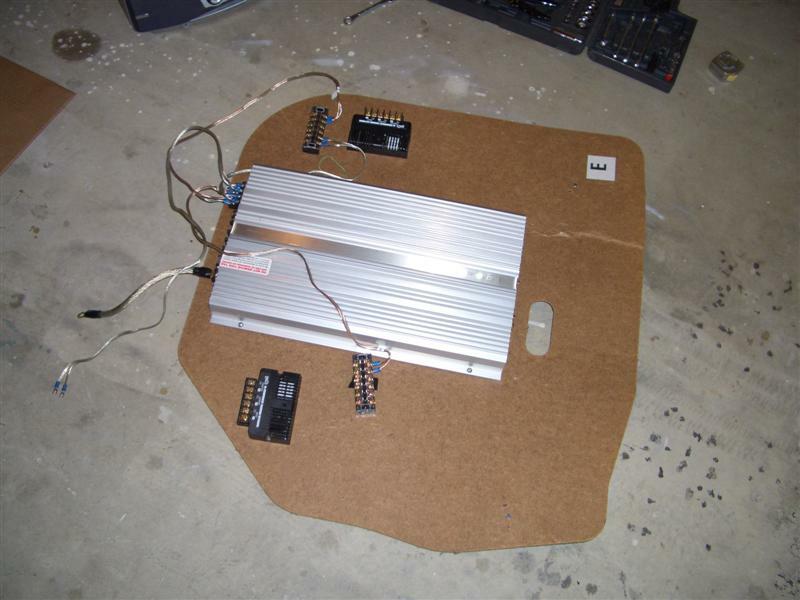 Also, if you are looking for a false floor, you will also have to manage wires if you plan to have the ability to lift the amp assembly up to retrieve the spare tire. What wood should be used? I knew it was on the heavy side but damn, not THAT heavy. A small piece of 3/4'' mdf shelve was probably heavier then my sub and the box it's in. I'm don't ever plan on racing in this car but don't want it to feel like there's always 3 passengers in it either. Looks good man! Nice install. 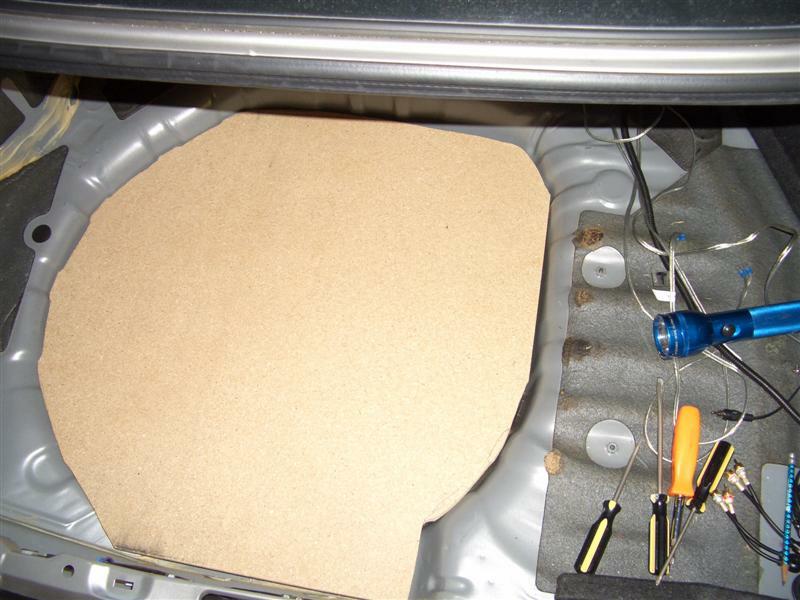 The amp is mounted on particle board (1/2" I think). 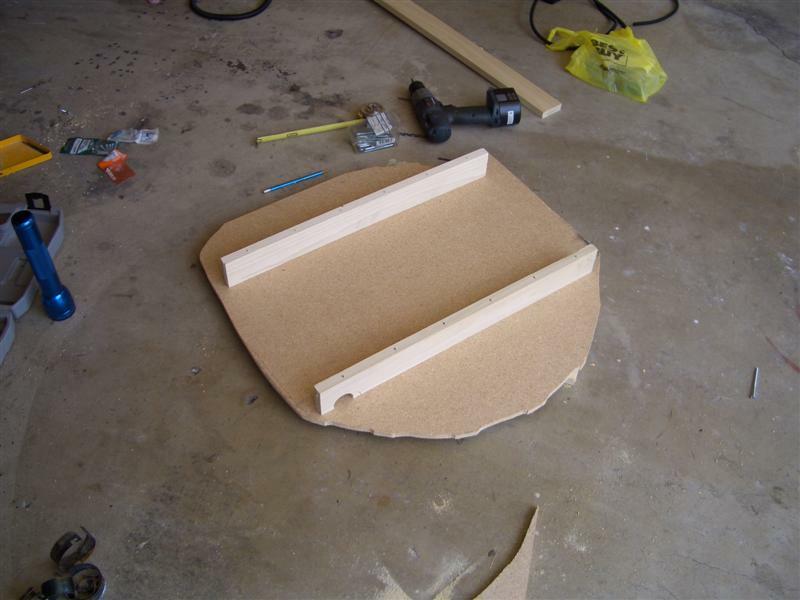 The panels I made to raise the rest of the floor to match the height of the amp is 1/4" fiber wood or something. Well, layed down some stuff to visualize what i'll look like. 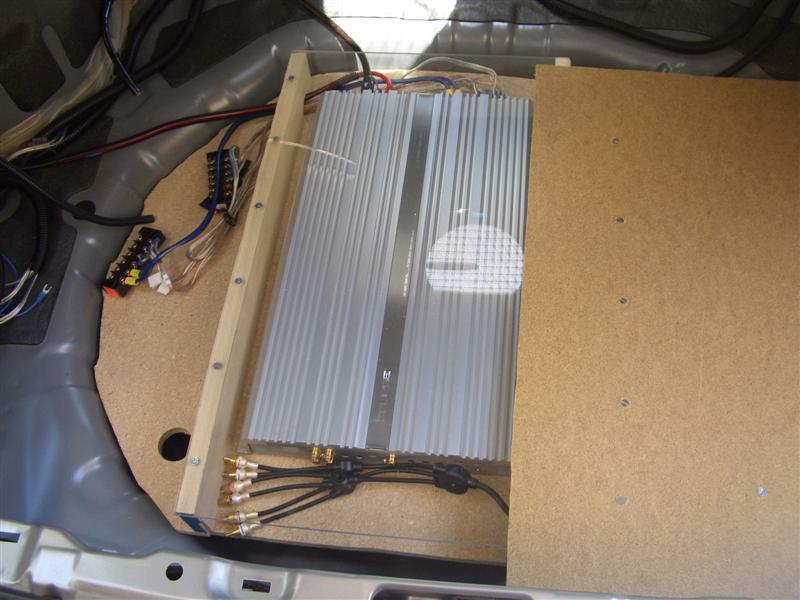 Boxes are abviously bigger then amps but with support beams and air space for ventilation and wires it looks about right. PA400.1 is just a little smaller then PA600.1 which will go in there. I realized there's really not much space there to do what i wanted. Keep in mind i'd like to keep my spare, easy access to it and fold my rear seat so i could transport 10' 2x4s. Any ideas on what else i can do with all these amps and sub box??? You might not need 3/4" MDF for the false floor. I use 1/2" as much as possible. If you need 3/4" wood then go with Birch plywood. Its half the weight or less and easy to work with. Doesn't make anywhere the amount of dust either. Of couse its more expensive but not too much. Very nice false floor. Work paid off!